Rent villas in Kissamos, Crete with private pools. Book affordable holiday rentals that are near a beach. 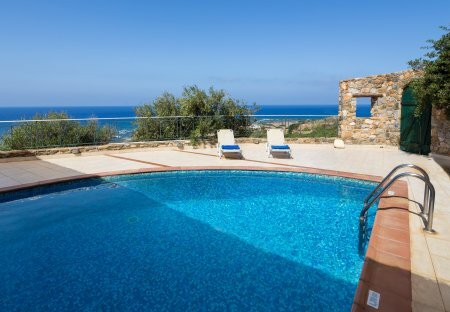 This 4 bedroom villa with private pool is located in Kissamos and sleeps 10 people. It has WiFi, a garden and barbeque facilities. This 1 bedroom villa with private pool is located in Kissamos and sleeps 3 people. It has WiFi, barbeque facilities and parking nearby. This 2 bedroom villa with private pool is located in Kissamos and sleeps 5 people. It has WiFi, barbeque facilities and parking nearby. The Azure Beach Villas boast a fabulous position just a short stroll from the beach and the amenities of Nopigia village. For those that wish to explore further afield. A Two bedroom Villa within the village of Rokka .We invite you to come to the most beautiful area of Crete . A luxury villa with a unique architectural and decorative touch, and equipped with everything a modern house requires. Villa Pounentes is the destination that will make your holidays in Crete unique. A luxury villa with a unique decorative touch, and equipped with everything a modern house requires. Villa Sirocco is the destination that will make your holidays in Crete unique. This luxury villa with the unique architectural layout, is placed in the most private area of the complex offering romantic times of relaxation as. viewing the sunset and the sea. Villa Scirocco is an absolutely delightful villa commanding a truly privileged position on the scenic coastal road heading west from the iconic harbour town of Chania. Villa Pounentes is a really wonderful villa in an utterly tranquil and idyllic location boasting gorgeous sea views. Constructed in a pleasingly modern design.